The central bank and government have remained largely silent as the currency plummeted to record lows and the U.S. imposed sanctions and threatened more. The lira rebounded after falling by the most in a decade on Monday, getting a lift from news that Turkish officials were headed to Washington for talks. The yield on 10-year bonds surged above 20 percent to an all-time high. Capital controls are now “more than a tail-risk scenario now as the authorities show no signs of reverting to more orthodox policies,” said Shamaila Khan, AllianceBernstein’s director of emerging-market debt in New York. What the lira really needs is “independence of the central bank, tighter fiscal policies and an IMF program,” she said. Late Tuesday, the IMF put out a statement saying it has “received no indication from the Turkish authorities that they are contemplating a request for financial assistance.” Meanwhile, U.S. State Department spokeswoman Heather Nauert said that Secretary of State Mike Pompeo’s call with Turkish Foreign Minister Mevlut Cavusoglu yesterday was, generally speaking, a "good sign." The lira was 1.4 percent stronger at 5.2539 per dollar as of 4:35 p.m. in New York, after tumbling more than 4.5 percent on Monday. Ten-year yields fell 19 basis points after earlier surging as much 42 basis points to a record 20.09 percent; the benchmark stock index was up more than 2 percent. Turkey’s deputy foreign minister Sedat Onal was leading a delegation with officials from the finance, justice and foreign ministries to the U.S., the foreign ministry in Ankara said in a statement, fueling speculation that a deal to patch up relations — strained by Turkey’s detention of an American pastor — may be in the works. The U.S. remains a solid friend and ally of Turkey, the U.S. embassy in Turkey said in a Twitter post, as it denied news in Turkish media that a U.S. official predicted the lira would weaken to 7 per dollar. On Monday, the central bank boosted banks’ access to dollar liquidity by $2.2 billion, an effort to take some pressure off the lira. The currency trimmed its losses briefly, only to plunge to successive record lows through the night as investors saw the move as evidence that the bank’s hands were tied. 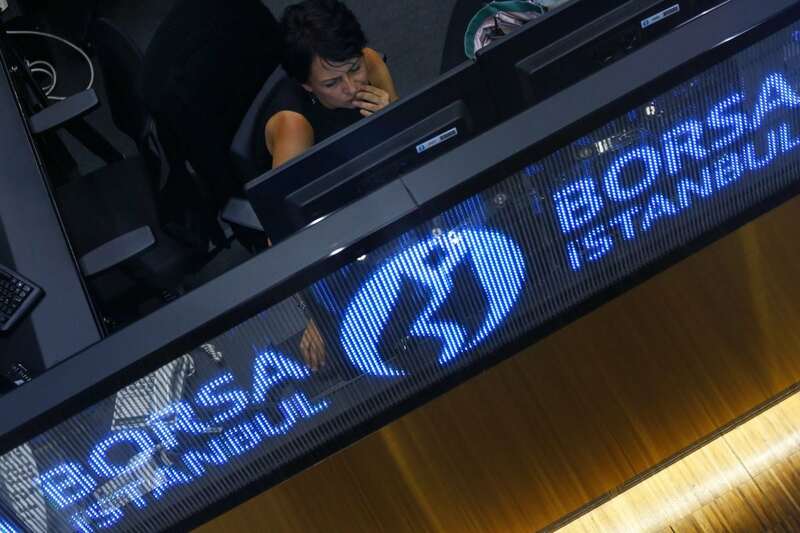 Turkey Inc. is weighed down by $337 billion of foreign-exchange liabilities, with a shortfall of $217.3 billion net against assets, according to central bank data. Bank borrowing costs are also rising ahead of more than $100 billion in debt payments coming due over the course of a year.